The long awaited wedding of our Tollywood stars Samantha Ruth Prabhu and Naga Chaitanya is just round the corner. It is going to be a destination wedding which will take place in West Goa on October 6th and 7th followed by a grand reception in Hyderabad. This is undoubtedly going to be the most happening wedding of the year in the Telugu film industry and we just cannot wait for it to happen. What’s even more exciting is that Samantha Prabhu recently instagrammed a glimpse of her wedding lehenga and we are literally awestruck by the beauty of it. 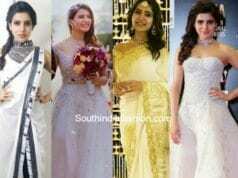 Samantha’s wedding lehenga is from designer Kresha Bajaj’s label Koecsh. 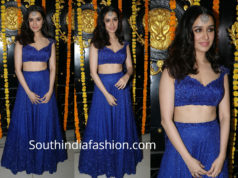 The very same designer who customized her white and gold engagement saree with the couple’s love story embellished at the border. Samantha Prabhu looks no less than a Goddess in the pictures and we are loving how gracefully she has carried the concept lehenga. Her jewelry includes a statement necklace from Vanraj Zaveri Fine Jewels which beautifully blends with the golden lehenga. 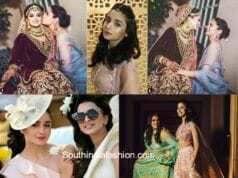 Take a look at the stunning glimpses of her wedding look. From the outfit color to the styling and the accessories, we are simply in love with the entire look and Samantha Prabhu has done complete justice to the super edgy wedding outfit. If the photo shoot pictures are this stunning we cannot imagine how gorgeous she would look on her wedding day. Can you wait for it? Well, we definitely cannot and are super excited for her D-day! 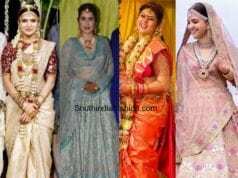 Five Telugu Star Wives Who Are Well Dressed All The Time!